Losing a friend this week was agonizingly painful. Many of us watched and prayed as each day, her body eroded further. Small glimmers of hope for a cure quickly gave way to quiet resolution that the end was near. As with Christ in the garden, we watched, we waited, we prayed until finally the gates of heaven swung wide and Carrie was clothed in white garments, embraced and welcomed. 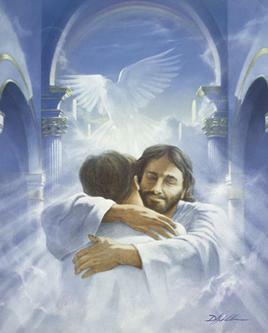 The veil between heaven and earth parted for a moment and we could see His arms welcoming her. Over the years, she taught me much about graceful suffering and the ability to remain positive, often encouraging many of us writers who struggled on a variety of business and personal issues. Facing my own health crisis at the moment, watching and waiting for various test results to come in, for the ultrasound appointment today, and waiting on my biopsy date is frightening, but not as frightening as it was in the beginning. Of course, if the news is grim, my mind will probably swirl as I struggle with my own mortality; but more so, for those who might be left behind, such as a wonderful husband, beautiful children, adorable grandchildren and dear friends. This focus on mortality is overwhelming in a sense that I frequently contemplate whether I have made the world a better place. Surely, there is wreckage in my path. I have not lived the perfect life, nor been the perfect daughter, wife, mother, or friend. My intentions have always been there, but my humanness and internal frailties sometimes took over, and I failed. Forgiveness is probably the area I have grown the most in myself and others…..yes I have been scorned and hurt throughout my life, but one day I realized that holding grudges for sins against me was only hurting my soul. If I could forgive, I could be free. Similarly, in my sins against others, I have begged for forgiveness and whether or not those in my wake chose to accept my apologies, I know that through the Blood of Christ, I am free. My prayer today, as it is each morning is to be the person Christ wants me to be and to do whatever He asks of me. There are days, I kick and scream, but in the end, I acquiesce. It has taken me a lifetime to truly embrace forgiveness, but it is so liberating and a blessing from God to be able to do so. He is Grace and Mercy; and through Him, I can be grateful for all I have had, and for what is yet to come. Everything has a purpose, we just may not know it until later. This entry was posted in cancer, death, forgiveness, heaven, life, understanding. Bookmark the permalink.